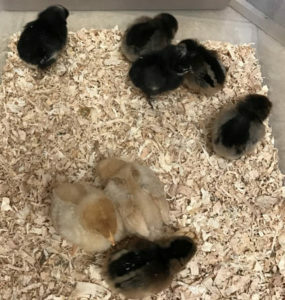 In February 2016, we made the decision to purchase 8 baby chicks. There were two each of four different breeds:-2 Buff Orpingtons, 2 Brown Leghorns, 2 Barred Plymouth Rocks, and 2 Ameriucanas. The original 8 baby chicks. We raised them in our sun room until the spring time when our son, Greg, and I built an outdoor permanent shelter for them. 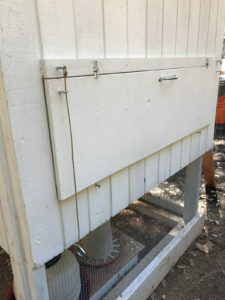 Greg did the design and building while I purchased the material and did “gofer” duties, The coop was built in a large fenced in garden area which provided some protection from predators. 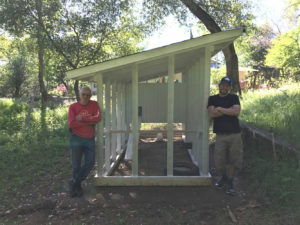 John and Greg at the early stages of the completed coop. Over time, Improvements have been made to the coop and enclosed yard. 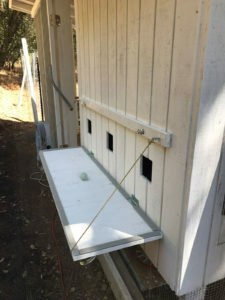 This includes a solar panel which charges batteries that power the door motor and allows exit and entry between the coop and the yard. The door is operated with a 12V motor. The timer is a 12V solid state version and is set to open the door in the morning and close it in the evening. Wire screen is buried along the perimeter of the coop to keep burring creatures from entering during the night. 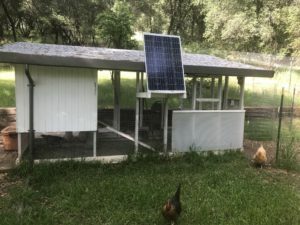 A recent photo of the completed coop and the solar panel. To keep climbing predators out of the yard, we put up a set of pulsed high voltage (HV) wires along the top part of the yard fence. The wires are on insulated standoffs and the fence is the ground plane. Below is the control for the HV and runs on 120 V AC. The AC power goes through a buried wire from the nearby garage to the coop area. 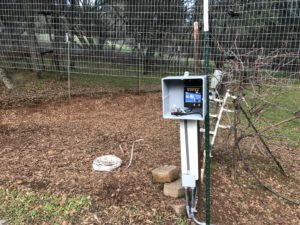 There are web cams at various locations through out the coop which allows us to monitor the chickens and conditions in the coop and yard area. The opened control box illustrating the pulsed HV source. 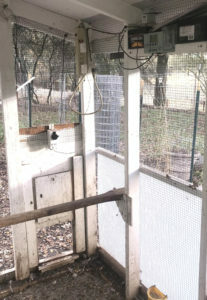 There are roosting bars inside the coop enclosed nesting area and in the open outside area. In hot weather, they prefer to roost outdoors and in cold weather they prefer to roost indoors. 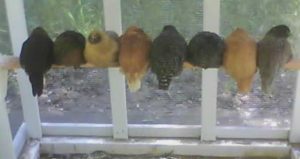 A photo of the original 8 grown chickens lined up on the roosting bar located near the coop door. A view of the door and the control electronics. The batteries and the solar panel charge controller are on the upper right shelf. The door motor is located above the door. The open door to the nesting boxes. The opened door to the nesting boxes. The closed door to the nesting boxes. The chickens are only fed organic egg laying feed. They are occasionally given a treat of dried meal worms and scratch grains. They have been prolific layers and at peak laying periods we can not consumed them fast enough.